Rating: 6.8/10. From 63 votes. 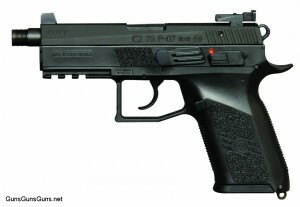 Summary: The description, specs, photos, pricing and user ratings for the CZ P-07 Duty pistol. The CZ P-07 Duty is a semiauto pistol built on a polymer frame and chambered in 9mm or .40 SW. CZ says it features the ergonomics and accuracy of the CZ 75 with a new trigger system. The new Omega trigger system simplifies the CZ 75 trigger system, uses fewer parts and improves the trigger pull. In addition, it allows users to choose between using the handgun with a decocking lever (installed) or a manual safety (included) by a simple parts change. The polymer frame design of the Duty and the new-profile slide (fully machined from bar stock) reduce weight. Easily a adaptable to low light use, the Duty features an accessory rail to which a light or laser can be attached. 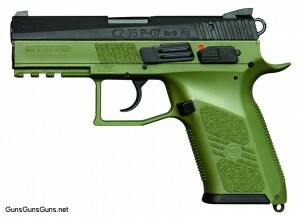 In April 2012, CZ began offering a suppressor-ready version and an olive-drab frame version. The first features a 1/2×28 threaded muzzle that accepts most suppressors made for the U.S. market. The sights on this variation are higher than normal to clear 1″ diameter suppressors and provide a good sight picture with larger diameters when shooting with both eyes open. 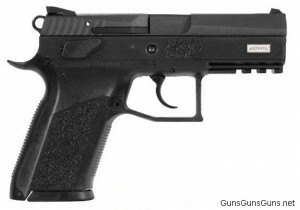 Note: CZ also offers a full-size version of this pistol, the P-09 Duty. This entry was posted in .40 SW, $501-$750, 9mm, Compact, CZ, CZ 75, Semiauto on November 3, 2011 by Staff.